The first know representation of eyeglasses was in a fresco by Tommaso de Modena in 1352, the concave lens was introduced in the 16th century and a Spectacle Makers Company was formed in England in 1629. 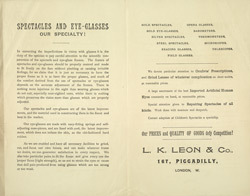 Spectacles had been introduced by the 19th century and optician’s stores like Leon and Co., were set up where wealthy members of Victorian society could buy glasses to help them see. In many of these stores it was the patients responsibility to choose the correct lenses, the optician would offer different glasses from their stock until the customer could see.